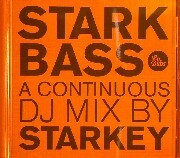 LoDubs is pleased to present Starkbass, A DJ mix by Philadelphia's foremost native son Starkey, known throughout the world as the undisputed king of the Dubstep/Club/Grime/Hip Hop/Wonky/Bassline hybrid sometimes referred to as Streetbass. Although largely composed of the first aforementioned genre, this 25 track DJ mix, comprised of almost completely unreleased material, shows how just how the genius from the east can relentlessly tie all these elements together in a mix, with an air that sounds as if they where all part of some larger style all its own. If you have witnessed and thus heard his phenomenom in person, you will know all too well what we are referring to, and therefore must have been lucky enough to catch one of his dozens of much discussed live sessions in recent history, on one of 5 of the 8 continents (he couldn't get a booking in Antarctica for some reason.............). Starkbass, as an album, captures this essence precisely. In the process of jumping around the globe with an arsenal of beastly tunes of his own creation, and the experience of being one of a select few to be featured on Mary Anne Hobb's �Generation Bass� program late last year, Starkey has developed a keen ear for hotness from both established artists and the newest/latest producers, allowing him access to the absolute freshest tunes, which is apparent in who is featured on the mix. From artists like Raffertie, who is just about to blow up large, with releases on Slit Jockey and Planet Mu, to established artists like Zomby, Joker, Geeneus, DZ, and Cardopusher, all came forward with their prime goods, and many with their exclusive bits they saved for just such a mega occasion. Throughout this 25 track mix, covering the entirety of a compact disc, it is clear that the hugely recieved full length Ephemeral Exibits released a few months back was far from a single lightning strike, and Starkbass is the step beyond, showing all the styles that make up the universe of Starkbass. Are you ready? 01. Starkey "Trouble in Starkville EP 3"
05. Starkey "Strike Now (VIP)"
06. Food For Animals "Mutumbo (Raffertie's Bigger Bass Remake)"
07. Drop the Lime "Crazy Love"
08. Bok Bok "No Need To Front 2009"
09. Raffertie "Antisocial (Dev79 remix)"
10. Kotchy "One For the Money (Starkey remix)"
12. Syntonics "Material (Bombaman remix)"
15. Geeneus ft. Riko, Wiley & Breeze "Knife & Gun" (Blackdown Devil mix and remix)"
17. Wonder "Give It To Ya"
23. Dubsworth "Done Gone There"